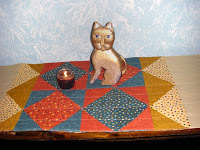 I usually post my art, or as lately, my quilting - which is another form of art. But I am also a decent cook. Just like my painting and my quilting, I frequently "make it up as I go." Tonight was no exception. Someone at work or on a blog or somewhere had mentioned stew. 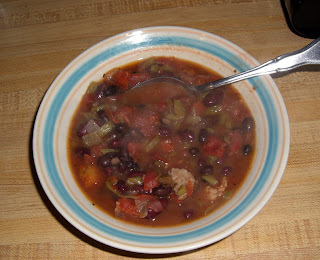 When I think stew, I think a tomato and vegetable dish with a little meat for flavor and texture. I looked in the cupboards. I usually keep LOTS of canned veggies. I am low on a few things though. So just be creative! I had tomatoes with green chilies, fire roasted tomatoes with garlic - so I used one of each so it is quickly seasoned. 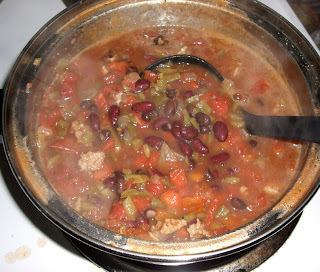 Some kidney beans, some green beans (I diced those) Hmmmm...what else. Oooh I know, chop an onion and lightly brown it in olive oil. Mmmmmmm-Good! Now throw in the veggies on top. Start thru the spice rack - oregano -sure I love it, seasoning blend, why not! A little of this, a pinch of that. Meat? Hmmmmm....oh there are some frozen meatballs. Six of them in the microwave for a head start, chop them and toss them in too. Hey, it smells good in here. Time to dish up a bowl full and chow down. Yes it is tasty. Less than 30 minutes start to serving. I wish I had had some cabbage to add and a small white potato, but oh well, I am loving this. I hope I can remember to do it again sometime. But, this will last me a couple of days. I may freeze a serving or two if I get tired of it. Several people said that they wanted to see what the Baby and I make. Well I must tell you that I made the Baby work on Saturday. Some of you said that "at least that Baby won't cry" - wrong, I made the Baby cry. And I expect to make that Baby cry pretty regularly. You see when the bobbin gets low, the sewing stops! Yikes, I wondered what I had done wrong. But a quick look at the display, showed a CRYING Baby. (honest! I should have taken a picture.) Anyway, the message says that the bobbin is low. You can sew a few more stitches then it happens again. When you need to finish a seam, that can be annoying. BUT if you have ever run out of bobbin and kept sewing for a couple of feet on a long seam, well you know it is better this way. I made the Baby cry at least three times on Saturday. Yep, three bobbins worth of thread. Other than those three times, the Baby performed like Nadia Comaneci in 1976. (-perfect -) Not a thread break, not a tangle, not a skipped stitch. AND FAST. Yes, FAST. Smooth as silk and a joy to sew on. Well just look, I made this Nautical themed Lap Quilt top. I measures approx 52" by 34". It is a Disappearing Nine Patch with piano key borders. I also made the beginnings of another D9P lap quilt. This one is nice and scrappy, which I prefer. So far it is approx 36" square. Didn't that Baby do some work? And only minimal crying. I only had to feed it some thread - I didn't have to change a single diaper! (that would have gotten it returned!) Ha ha. It is Pat at Silver Thimble Talk. She is asking " How long have you been quilting?" My answer is "since March of 2008" Yep about a year and a half now. I have a new Baby in my family. I knew that babies were expensive, and this one was more than I wanted to pay, but I love babies. And anyway a baby is such a joy. Now I know that EVERYONE loves to look at baby pictures, and oooh and ahhh. Right? It is nice when you get a new baby in the family to have all the BABY stuff that you need. This Baby came with stuff. How nice is that? Are you ready for the first picture of my new BABY? Or do should I tell you the BABY name I chose? Actually we brought that Baby home and haven't named it yet. For now, I am just calling it Baby. Picture time!!! Babylock Espire, my new BABY. 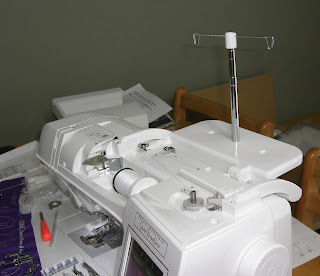 This Baby has a button to raise the presser foot AND an automatic pivoting function that when you stop it lowers the needle and raises the foot. THEN when you start sewing again it lowers the foot. I mean, how cool is that? Did I mention that this is post 250? Did I mention that I have a birthday at the end of this month? Rules? We don't need no steekin' rules! OH yes we do! ha ha. 2. I must be able to contact you. Either post an email address OR have it available thru your blog profile. 1 For posting a comment. 2 for Following - let me know by posting that you started following OR are already following. 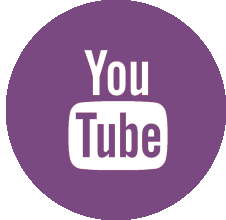 2 For blogging about it on your Blog by Sept 29 5pm CST. Comment to let me know you did - I will be checking! so you can get up to FIVE entries. All comments MUST be made to this entry to be counted. I will close the entries on Oct 2nd at midnight CST. Thanks for going on this wild ride with me. I hope you stay and see where it goes next. I thought for post #249 I would feature an item I have in my Etsy shop along with some information on the evolution of the piece. 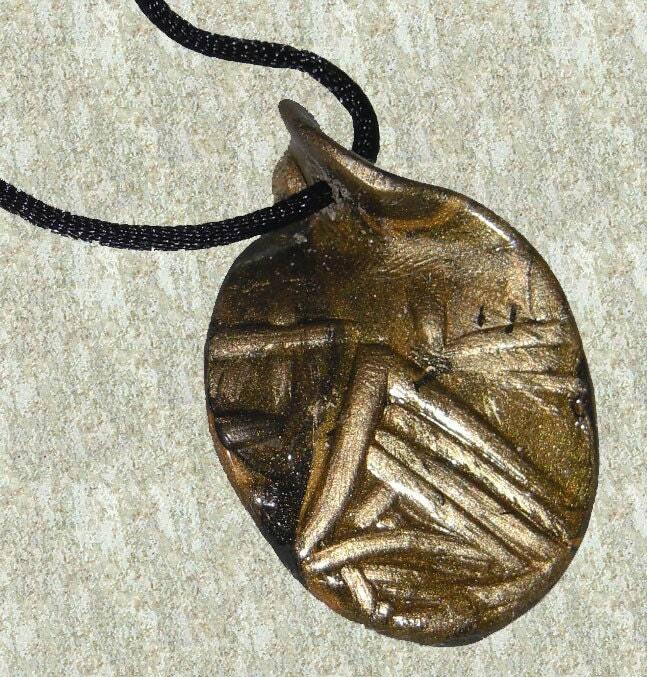 This pendant is one I chose to call "A Touch of Gold" It is hand made of polymer clay. When I first started playing with polymer clay, I found that just rolling the clay in your hands is therapeutic. (or is that just me?) Anyway, I started making freeform beads. There are all types of molds, etc you can buy to work with polymer clay. For me that is NOT the artistic option. I prefer to shape things with my hands. Having said that, the design on the piece is impressed from a carving. Don't get excited, I carved the piece myself from a rubber block. Thus I did shape it with my own hands. The design is original with me. I see some personal symbolism in it. I don't explain what I see in an abstract piece until the viewer has made a statement of what they see. So I won't be posting that here. I will say that it is a symbol of my belief system. After shaping and imprinting the design on the pendant, I baked the clay to harden the polymer and retain the shape. After baking, I painted, with artist acrylics - not the cheap stuff- and let that dry. There is more than one application of paint and then it is sealed. So that is the basics of how it was created, and here it is for your viewing pleasure. I just realized that I am at post 248. That means post 250 is VERRRRRRYYYY CLOSE. Something else is very close also. What? Should I blatantly say this? Sure why not. This is a small painting titled "Tree line"
My Birthday is the last day of this month. NO! I am not telling my age. (Because I am already "old enough to know better") Let's just say, when I started where I work, I was one of the youngest. Now I am in the elite group of the oldest. OUCH! that hurt. I forget I am old most of the time. (not OLD, just "older") sigh. What should I do to celebrate the two? any ideas? I did buy some fabric this past weekend. I do want to up my "followers" number. Do the math. Get ready. Judi (aka the Green Fairy) at Green Fairy Quilts is having another giveaway. You see, she has a new pattern (or two) and is giving everything you need to make the quilt top. She has even made the hourglass blocks for you. How totally cool is that? A project that is already started - ready to dive right in. Go on now....enter! Just look at what is waiting for a new home!!! I got home this evening and sat at the computer for a while. It is surely easy to get lost in cyberspace sometimes. But I did manage to drag myself away. There was my little quilt project waiting for me. I had a bit left to quilt and then I needed to make and put on the binding. I really didn't expect to finish it this night, but I just kept plugging away. I got the quilting part done. So I said, "well, at least I can trim it to square it up." Rotary cutter and portable mat, quilt and me, all down in the floor. "Gee," I thought, "what will I bind it with?" I looked at several options. I wanted something that didn't contrast too much with the black borders. So I put several things up to it to see. They weren't making me happy. Then I saw a black with a small cream pattern. "Hmmm, I wonder!" I did notice that the blacks didn't exactly match...but I liked the fact that the black and cream were similar to the borders that I had quilted with cream thread. "Okay, I can cut the binding and join it together at least" I did it....not to late yet...... "I can at least sew it to the front of the quilt and finish it tomorrow." Each step was -just a little bit more right up until- "WOW, I finished it!!!" If you enlarge the picture (and maybe if you don't) you can see my far from perfect free motion quilting. Last week, I thought it was going to ruin it. Tonight, I am thinking - "Quirky and fun!" I can't wait to wash and dry this baby and see how it comes out. Go right on over to the Missouri Star Quilt Company Cutting Table and sign up. 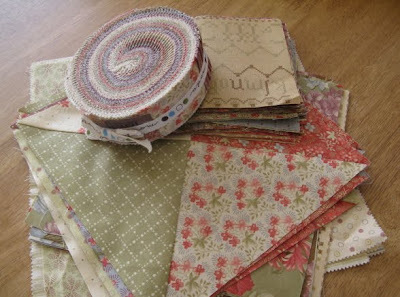 It is Jelly Roll Week and the goodies could be FREE. Oh, now you are gonna run off without even saying hello, aren't ya? I can't complain, that is what I did. Ha ha. Dont' worry I didn't fall off the edge of the world. I am quilting the D9P Charmed quilt. My first free-motion quilt. I think my lines look a lot like a 3 year old took a crayon to the wall, but it will be quilted. Ha ha. I may even show it here when I get done, but maybe not. I have made large quilts. I have made tablerunners, purses and other things. 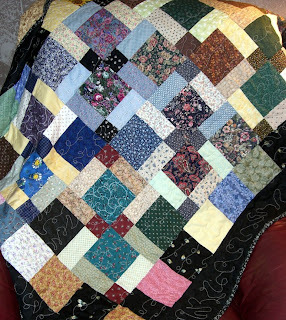 But I realized that I have never made a lap quilt. I know, I started out backwards. Yep, that is my way. Do the hard stuff then back pedal and do the easier stuff. Anyway, I was actually planning to make a square tablerunner from the Disappearing Nine Patch squares I had made. So, I sewed two sets of two together, then joined those into a square. AGGGH, I didn't like the layout. All the blue was in one half, while all the brown was in the other half. It should have been one square with blue diagonal from the other square with blue. The same thing with the brown. I HATE un-sewing (aka-ripping out seams). So on to Plan B! Oops, whaddaya mean there is no plan B??? 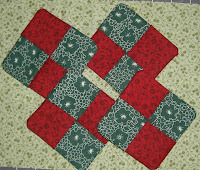 I took some charm squares, sewed them into rows and added them to all four sides of the piece. Hey, how big IS a lap quilt? Off to internet land to see. Wow, there are as many different sizes as there are patterns. Okay, wing it! I decided it was close, so if I added some borders, yes, perfect. I added wide borders on the sides and narrower borders on the ends. Hey, that looks sharp. I need a picture and a blog post. The weather is cooperating. (we were supposed to be getting 5 inches of rain today.) But the sky is slightly overcast and still bright. Out to the fence to make a picture. Wow...look at that. I made a pretty little quilt. Now it just needs a back , batting, quilting and a border. That will be another day. For now I am just happy! Barb said she couldn't see the one from Flickr, so here it is again! This time hosted by Blogger. But first a message from our "sponsor" LOL Terri at Sew-Fantastic (see that button on the side there) is having a giveaway. After you finish here, go enter. 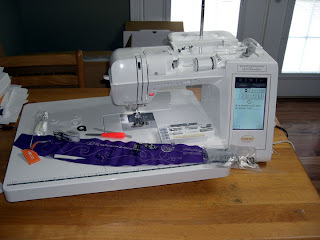 About a week ago, I was a guest blogger on the We Love Quilting blog. That link will take you straight to my post. I am re-using PART -but not all- of that for this post. I have seen several "how I got started" posts lately, so I am going to fill in a few details. When I was fairly young, my paternal grandparents lived next door. Granny Black, as we called her, was a quilter. I don’t remember ever seeing her piecing, but I am sure she must have. I do have vivid memories of her front porch with the quilt frame hanging from the rafters. When it wasn’t in use, it was just pulled up to the top. When it was in use there were several women crowded around it quilting and talking. Where was I? I was sitting in the tent. Ha, right under the quilt. I was plenty far away to not worry about the needles. But I was close enough to see the patterns from the quilt, which happened to look abstract from that angle. Plus there was the play of light and dark from the arms reaching to sew the quilting stitches. 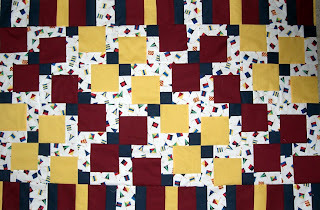 That is my earliest quilting memory. I remember quilts too. There was always a quilt on my bed. One was a little Dutch girl that had blanket stitches around the appliqué. I loved the texture of that embroidery floss around the smooth fabric. I suppose I was a strange child. Some things never change. Ha. I also started crafting, learned to crochet (but still can't knit!) Then in High School, back when it was still politically correct to have different classes for boys and girls, I took Family Life. It was really Home Ec, but for the guys. So, in Family life we had a section on sewing. Can you guess what we made? You got it, the dreaded APRON pattern. We had to use our apron later when we had cooking. (mine was flawless!) Anyway, that taught me to sew a seam, and -more or less- Follow a pattern. I don't typically use a lot of patterns, as I prefer to make it up as I go. Doesn't mean I don't look at them and I actually have a few. Sometimes I even use them. Okay, okay, I admit, I use them, but I change stuff - hey I do that when I cook too! It is the creative gene Kicking IN. Later I got a job making enough to have "disposable" income. 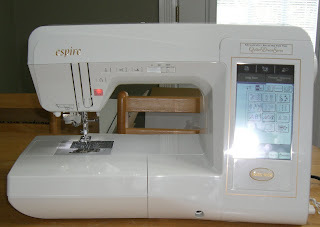 A church member was telling me about her NEW sewing machine. I asked about her old one. SOLD! LOL, yes it was used. It was (is, I still have it- still works) a Kenmore zigzag in AVOCADO green. I made shirts for me, and if I wouldn't wear one because I made a mistake, my sister would acquire it and she always looked so terrific in it, I wanted it back. But I let her keep it. Now a few of you will remember the Dashiki shirts from the 70's. I got a pattern from those that I darn near wore out. I love shirts with no collar, so those were a joy to make and really easy. For years I quit sewing except to hem a sheet to make curtains. LOL. I also did a FEW minor repairs on my clothes. But I hung on to that machine. 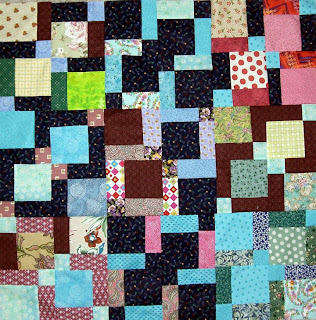 Fast forward, March 2008, a co-worker said "I am teaching a class on foundation paper piecing. 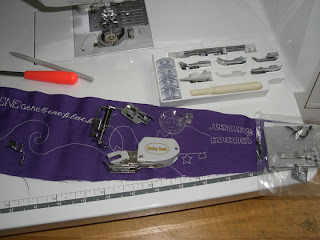 I will give you your first class free" - Yep, just like a drug dealer 'just try it' So My first (I think) sewing post was this. And I was hooked. 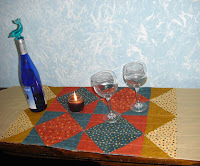 I took the class she gave on making a table runner too..and well the rest is all in this blog. The Side Note to "This is Sharp": Several people commented on using the oil - most didn't use it. Some wondered why. I got curious. The oil acts as both a lubricant AND a vehicle to carry away the grit and fine grindings from the blade. Thus the blade ends up sharper than if you didn't use it. I use sewing machine oil since I have it right there with my sewing stuff. I can't believe it. I am stocking up on wins in giveaways. I posted about the Fat Quarter win. Now I have won "however many selvages I put in an envelope" from Quilt Taffy. I am thinking I will finally make a little journal for myself. I think what I make will depend on the words in the selvedges. If I can do something creative with the words, I will. Granny always said "Things come in threes" - well I checked the lottery numbers this morning, darn, not today! I am waiting for number three! Ha ha. 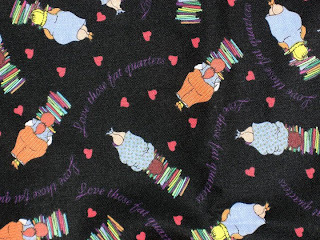 I posted here about a giveaway of "Four Fab Fat Quarters" --well I was wrong. It is FIVE FQs. Color me happy. Why, well if you read the title of this you know. I WON. And who says "less is more" Nuh-uh! More is MORE...and I am glad it is MORE than four. Here is the picture from the blog. 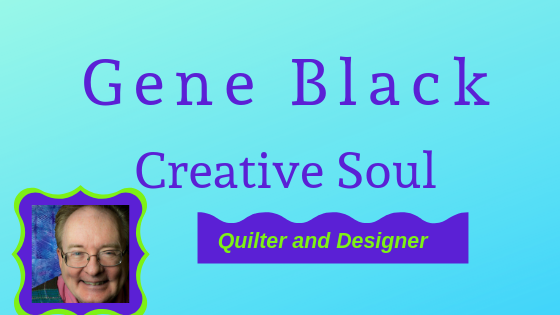 A big Thanks to Quilts by Lee for hosting this giveaway. I was reading reviews a while back and decided to give this little gem a try. It is a do-it-yourself sharpener for rotary blades. Now we all know that those things are an expense -but we have to have them if we rotary cut. So I have some tips. A. When your blade gets dull, flip it over and try it again. It seems we dull one side faster than the other. It can make a difference. I can see that it is worth the price. I sharpened my blade last night and WOW just like new. Be sure you have some sewing machine oil on hand. One little drop on the side you are sharpening makes this thing work a lot better. (and sharpen both sides! )Read the directions and use the appropriate side. If you blade doesn't have any nicks, no need to use the rough side. C. Spend the money you save on rotary blades on more fabric! a little update: Several people commented on using the oil - most didn't use it. Some wondered why. I got curious. The oil acts as both a lubricant AND a vehicle to carry away the grit and fine grindings from the blade. Thus the blade ends up sharper than if you didn't use it. I use sewing machine oil since I have it right there with my sewing stuff. Actually, I celebrated on Saturday night, but that is okay. It was the holiday weekend. A group of ladies known as the Mohr4, Celtic Fiddlers, were playing at Sparky's coffee house in Guntersville. I am lucky enough to know the family from my church where they are members also. Three of the young ladies play fiddle, while the youngest plays cello. The mother, Michelle, plays accompaniment on piano and also plays a delightful pennywhistle. I am posting a picture of the three fiddlers, and a couple of short videos. I find Michelle's pennywhistle version of Southwind to be hauntingly lovely. I must have been a Celt in my past life. If you don't like Celtic music, then don't play these. But personally, I love it. Linda at Fiber Fabrications is having a multiday giveaway. First up is the Lavendar Sachet/pincushion pictured above. So "go see Linda" and enter and...oh yeah - good luck! 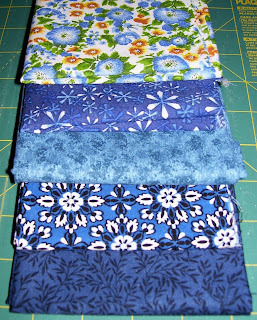 That's right Lee at Quilts by Lee is giving away Four Fab Fat Quarters. Go read about it.